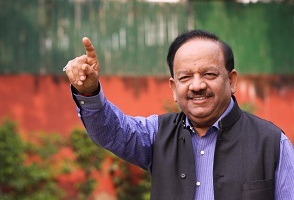 The Union Minister for Science, Technology and Earth Sciences, Dr Harsh Vardhan led the Bhoomi-Pujan ceremony for construction of the Borehole Geophysics Research Laboratory at Hazarmachi, Karad. Speaking on the occasion he said the government wants to find solutions to possible problems of the people due to natural calamities through such scientific researches. This Borehole Geophysics Research Laboratory (BGRL) is being established by the Ministry of Earth Sciences, Government of India to address challenging seismological problems of societal relevance through drilling investigations. BGRL was conceptualized as part of the Ministry’s programme of Scientific Deep Drilling in the Koyna Intra-plate Seismic Zone, Maharashtra for geological investigations and modeling dedicated to earthquake research in the area. Reservoir triggered earthquakes have been occurring persistently in the Koyna region since the impoundment of the Shivaji Sagar Lake in 1962. The 6.3 magnitude Koyna earthquake in 1967 is the largest triggered earthquake in the world. Till date, 22 earthquakes of magnitude 5 and above, 200 earthquakes of magnitude 4 and above, and several thousand smaller earthquakes have occurred in the region. All earthquakes are restricted to an area of 30 km x 20 km only. A strong correlation between continued earthquake activity and the annual loading and unloading cycles of the Koyna and nearby Warna reservoirs has been established. However, a model to comprehend the genesis of reservoir triggered earthquakes is elusive, due to lack of observations from near-field. Under this programme a unique approach to understand the mechanism of earthquakes in the Koyna region is planned. It is proposed to drill deep boreholes to reach the depths of earthquakes in this region and set-up a deep borehole observatory. Direct observations in the source zone of the earthquakes will provide new and critical information to model these earthquake mechanisms. Permanent infrastructure including office buildings, advanced laboratories and a state-of-art core repository are under development at this campus in Hazarmachi, Karad. The Govt. of Maharashtra has provided the necessary land for the purpose. The goal of BGRL is to emerge as an Institution of international repute housing highly specialized geophysical, geological and geotechnical facilities related to earthquake research. Shri Chhatrapati Udayanraje Bhosale, MP, Satara Shri Prithviraj Chavan, MLA Karad South, Shri Balasaheb Patil, MLA Karad North, Shri Anandrao Patil, MLC, Karad and Dr M. Rajeevan, Secretary to Govt of India, Ministry of Earth Sciences also participated in the function.